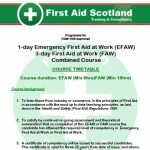 EFAW « First Aid Scotland Ltd. The Training Matrix. EFAW full course profile and booking form. 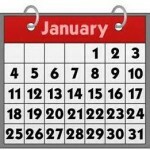 Public Course Cost Public courses : £85.00 + vat per delegate. Description This Emergency First Aid at Work (EFAW) course is an ideal entry level first aid course for the workplace, and is both First Aid Industry Body (FAIB) approved, and run to the current Resuscitation Council (UK) 2015 guidelines. It is a 6 hour, 1 day course, designed to equip a person to take on the role of an emergency first aider with basic skills, and to provide industry required statutory first aid arrangements in a workplace to comply with the Health & Safety (First Aid) Regulations 1981. This 1 day course is both informative, and fun, and delegates are actively encouraged to contribute (we don’t like death by powerpoint any more than the next), and student feedback indicates we’re doing it right.